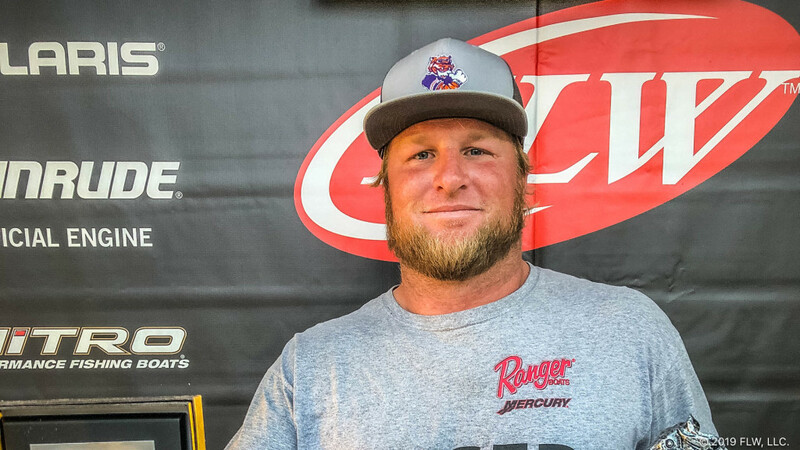 SENECA, S.C. (Feb. 11, 2019) – Boater Joe Anders of Easley, South Carolina, caught a five-bass limit Saturday weighing 14 pounds, 11 ounces, to win the T-H Marine FLW Bass Fishing League (BFL) Savannah River division event on Lake Keowee presented by Navionics. Anders earned $4,164 for his efforts. Anders said that most of his fish came on an EverGreen JT 95 topwater bait in his mid-lake areas, but he also caught a couple of key fish skipping docks in 40 feet-of-water with a bait fish-colored Zoom Swimmin’ Super Fluke Jr. along with a late-day keeper on a drop-shot rig. “I only caught around 10 keepers, and I really struggled the last 3 to 4 hours of the tournament,” Ander said. “I caught my last one late in the day drop-shotting a 6-inch, straight-tail Roboworm, 35-feet-deep, and was able to cull up 4 ounces. I ended up winning by 3 ounces, so that fish was the difference maker. 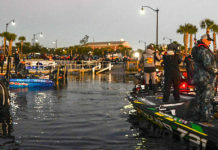 Anders’ big fish of the day was a 6-pound, 3-ounce largemouth bass, which also was the tournament’s biggest bass of the day and earned Anders the Boater Big Bass award of $450. 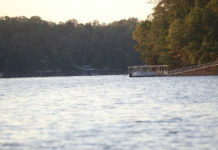 Nathan McClure of Hiawassee, Georgia, won the Co-angler Division and $1,957 Saturday after catching five bass weighing 12 pounds, 7 ounces. Nathaniel Moore of Fairview, North Carolina, caught the largest bass in the Co-angler Division, a fish weighing in at 3 pounds, 9 ounces. 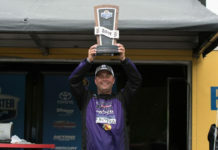 The catch earned him the day’s Co-angler Big Bass award of $225.